Its been several years, maybe decades since Charlestown earned hardware of any kind in the sport of volleyball. Saturday morning changed that, as the 2016 Lady Pirates finished another busy week of volleyball by participating in the Bethany Burrier Invitational at Borden High School. The Lady Pirates defeated host Borden 2-0 (25-19, & 25-10), then conference rival Scottsburg 2-1 (25-21, 16-25, & 18-16), and finally Shoals 2-0 (25-11, & 25-14) to take the Invitational Championship trophy home. 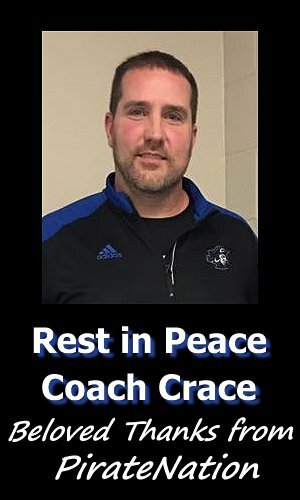 The three invitational wins improves Charlestown’s season record to 12-9 (5-2 in MSC) and caps a 6-0 week after wins over Eastern, Lanesville and Salem earlier in the week. 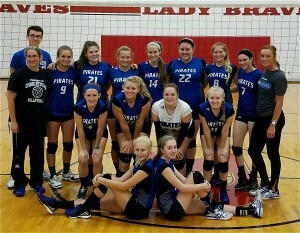 “I am extremely proud of our Lady Pirate Volleyball team! We had a long week with three matches in a row, so I’m happy with the way the girls came out and gave 100% effort despite being a little fatigued. There were a couple of times in the Borden and Scottsburg match where we found ourselves several points behind, but the girls continued to fight back and make big plays at critical times to get the win. 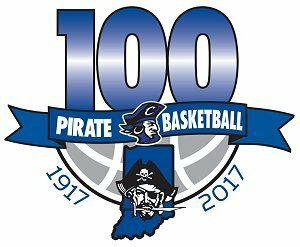 This team plays with a lot of heart, and I’m proud of our program-from the players on the floor to the support from the bench and stands”, commented Lady Pirate Head Coach Tammy Nuxoll. Saturday, the Charlestown offense was led by Kaia Reid with 25 kills, while Kiersten James and Amelia McCoy added thirteen kills each. Maddie Nuxoll logged 62 assists for the Lady Pirates Saturday. Emalee Craven had a great day serving, finishing with twelve service points in a row against Borden in the second set and seventeen against Shoals along with 4 aces on the day. Emalee also led the Lady Pirate block category with 6, while Maddie Nuxoll added four. Chrissa Ledbetter and Kaia Reid led the defense with 18 digs each respectively. “This upcoming week is critical for us as we play our final two conference matches”, summarized Coach Nuxoll. 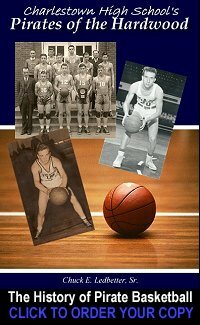 Charlestown travels to Austin Monday and Scottsburg on Thursday, both games to be broadcasted live by Pirate Pride Sports on www.CPPSB.com.